The United States Diplomatic Mission to Nigeria has said the contribution of the US government to the Multinational Joint Task Force (MNJTF) on Boko Haram is $5 million, not the $5 billion as REPORTED on Monday by the News Agency of Nigeria (NAN). NAN had QUOTED Linda Thomas-Greenfield, US assistant secretary, Bureau of African Affairs, as saying during a press briefing with the US delegation to the African Union Summit that the US government donated $5 billion to the MNJTF. But in a statement to clarify the issue, the public affairs division of the consulate wrote: “Yesterday, Monday, June 15,MEMBERS of the US government delegation to the African Union Summit in Johannesburg, South Africa briefed reporters on the range of US engagement in Africa. “It was widely REPORTED that the US is offering $5 billion to the multinational task force to fight Boko Haram. The U.S. Embassy wishes to clarify that the amount is $5 million.” According online news website, The Cable, the US Embassy clarified that at the conference, a journalist from Punch Newspaper had asked to know the assistance that US was offering to the fight Boko Haram, seeing the renewed commitment of Nigeria and its neighbours to combating the threat. 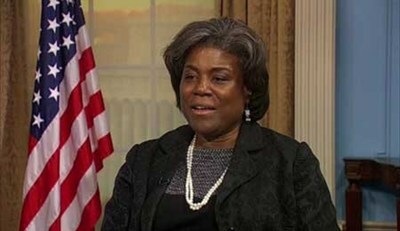 It quoted Thomas-Greenfield as saying: “We have been working with Nigeria as well as the other countries in the region, to ADDRESS their concerns about Boko Haram, because we don’t see this as just a Nigeria problem. “And with the new government, we are having discussions with them on how we might bolster our support. We have already been working with them on providing information, providing some training and support, and we look, with this new administration, to see how we might increase the level of support that we are providing to Nigeria. “At the same time, we have just announced since I have been here at the AU, a $5 million contribution to the MNJTF. This funding is going to the AU. We are also providing some equipment and support, and we had a number of meetings with the countries which are MEMBERS of the multinational task force to look at other areas that we might support.” -Greenfield had also used the OPPORTUNITY of the conference to answer questions relating to US cooperation with other African countries in fighting terrorism.